I consider myself the bad boy of all, fixing things up around the house and my husband might consider me, BAD. I rip through his tool drawers, chests, cabinets and mock things together in order to get what I need. While I try and put everything back in its place, I can’t help myself and I also organize, clean and really change up what is the ‘guys’ zone in my house. I needed a tool, but I came away feeling really organized and satisfied because I also go to organize and clean up a section in the house. Now, what would happen if I NEVER had to travel to his workbench, tool chests and rummage through his cupboards? I bet he would be a very happy guy because the man mess would be left in tact and I also guess I would have more time to do more shopping, rather than cleaning. Personally, I can’t survive like my husband does, he knows which drawers things are in, but they are not ordered by size and surely they are not sparkly. However, he knows what drawers things go in, and messing with his system, reorganizing and shining up tools so they sparkle is really not part of their gig, right? Well it happened again, I found another project that needed done in the house, as a home is a license to do, redo and work some more. However, today, I have to tell you, I never set foot into my husband’s workbench/tool shop, rather I stayed in my socks, traipsed up to my room, walked into my walk in closet and well…., my heart started beating a bit faster as I saw the black dust cover sitting on a shelf waiting for me! Are you ready for what is inside my black dust cover bag? 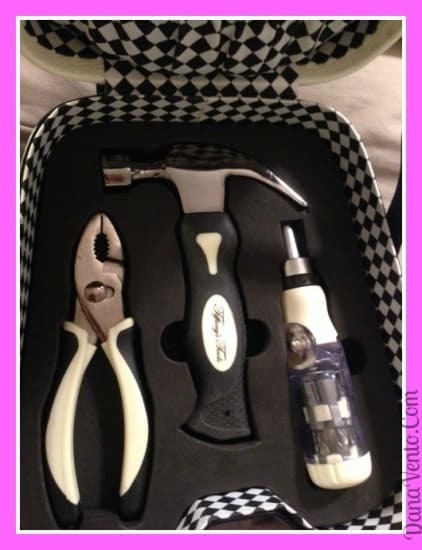 Let’s lavishly get tooled up and live DIY out loud, feminine and totally fashionable with upscale designer tools. You know, it’s never just about the project but the tools that get behind the woman that handles the project. How does that saying go???? As I got closer to the dust cover, I want to forewarn you that it is protecting my most coveted treasure to date and I am about to take it out and and get busy, tooling things up. My flair for fashion has no end, you know I am a Louis Vuitton addict who loves to strut fashion, so why should working with tools be any different? I want upscale, designer tools that fit my hands and that I have found. I have worked with those little ‘pink’ tools they sell in the large retail stores, and basically what you have there is a pink handle slapped onto men’s tools, no special contouring, no nice-to-touch material and by no means are they fashionable. I want sleek, unique and woman ergonomic! Inside this dust cover is a rather stylish bag which boasts a set of tools for the ladies. I am ready to open my collection of tools that are sleek, soft to touch, ergonomic in fit and oh so chic. This case of tools is black and white tweed, with patent leather, and specialized closures and they exemplify sass, fashion and DIY Feminine. Think of it as the nanny meeting Mr. Sheffield, a combination of sophistication and elegance unfounded until Tiffany’s Tools came along and made fashion meet tools. I have done a lot of DIY in my lifetime, from hanging pictures to setting up bedrooms, nailing in shelves and more and personally, I don’t want that basic wooden handle hammer, nor do I want chrome tape measure but that is all that is available. Sometimes I feel like women don’t count, but again, Tiffany has changed all this, because not only has Tiffany’s Tools created products that work, they also exude femininity so you can strut fashion while placing that photo. This is soft to touch and the shiny part is smooth, something nice to touch. Also note how nicely it fits in my hand. The pocket on here is where this stays, so it is always organized and waiting for me. 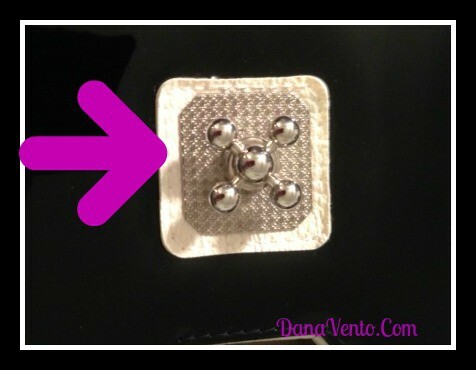 I wield a mean screw driver and when it’s time to fix knobs on cabinets, or tighten up drawers that have loose handles I simply grab Tiffany’s Tools and makes them Dana’s most reliable, bag of tricks! I love that my screw driver bends so when I need it to go into tight spaces it works. Tightening things in odd places like small drawers or places without a lot of space are perfect ways to use this! The head on this thing is fantastic, in fact, taking a whack out of things makes me happy and relieves tension. The grip is firm, yet soft to touch and it makes me happy to really sink in to what I am tapping on. Here’s the other thing, no splinters from a wood handle when I am done. 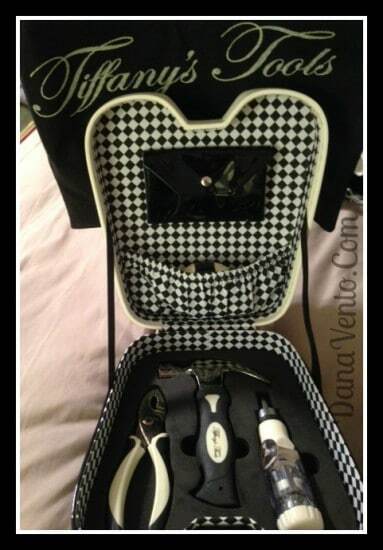 Now when I am done working with my tools, I simply place them back into the Handbag, close the closure, wait .. I can’t go on until we pay proper homage to this closure, love it! It almost reminds me of Jacks from when I was a kid, or maybe when I open it a treasure vault! Once the bag is close, my tools remain in tact, in their proper and most organized spot until I am ready to use them again. I do hide them because I am not sharing this diva-tastic find with anyone in my house, let them go grab the stinky old tools from the workbenches. Lavishly live DIY projects out loud with a specialized tool kit, created especially for the ladies who know how to wield a tool but prefer to have their tools a bit more ‘cultured’ and fashion forward.